Have you been wanting to learn more about what financial planning can do for you? Or maybe if you should consider a financial planner at all? 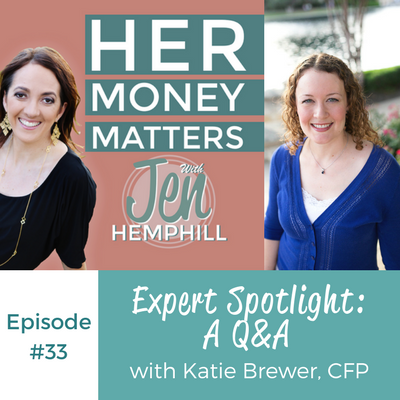 In this episode we speak to Katie Brewer, a Certified Financial Planner. Not only do we get to know her on a personal level but she answers some great questions we received! What questions would you have loved for Katie to answer? Be sure to let us know in the comments below. [0:00:25] JH: Welcome, welcome, this is Jen Hemphill. Thank you for tuning in. We have literally past the six month mark of this podcast. Thank you so much for being such a great supporter and we are already at episode 33. I’ve got to tell you, I’ve got some great guest lined up and some great solo episodes that I’m doing. So you can say this New Year, this 2016 is definitely in full swing. Today’s guest is one of our expert highlights that I’m going to be doing quarterly unless there is more of a demand for it. Maybe I’ll implement more so you will have to let me know. You want your voices to be heard and she is a certified financial planner. So if you are looking to hire a financial planner, are looking to get some guidance in the long term for your finances, this is a good episode for you. So you can meet our expert, you can get a better feel for the field and it is a loaded episode but it’s all good. It’s all good stuff. So this is what you’re going to learn in today’s episode. You’re going to learn how this pre-med student found her love for financial planning. You’re going to learn what important lesson her grandfather shared about negotiation. And the simple breakdown of all those fancy titles in the financial planning industry. You’re also going to learn four tips to help you find the financial planner that’s just right for you and the key difference between what financial planners know versus what you find on the Internet but there is definitely so much more in addition to that. So let me go ahead and share with you about our guest. Her name is Katie and Katie Brewer, a certified financial planner is a financial coach to professional women of the Gen X and Y generations, I just said that redundantly, and she is the president of Your Richest Life. She has accumulated over 10 years of experience working with clients and their money. Katie has been quoted in articles in the New York Times, Forbes, Money, Real Simple and many others. She regularly speaks to groups and writes about financial planning topics. So let’s go ahead and meet Katie. 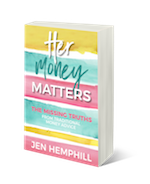 [0:03:01] JH: Welcome Katie to the Her Money Matters Podcast. I am so excited to have you here. [0:03:07] KB: Hi Jen. I’m very excited to be here. [0:03:10] JH: Well, before we get into these financial planning questions that I know you’re dying to answer, I really want to get to know you. Let’s just have some fun and get to know you, are you game with that? [0:03:26] JH: Perfect. So I wanted to know first is why, I’m just curious, why did you become a financial planner? [0:03:34] KB: Yeah, well I was in college studying not financial planning. Actually, I was studying biology. [0:03:41] JH: I started as a biology major too. [0:03:43] KB: Did you? Oh, yeah we can cry about how much organic chemistry was like the worst class I’ve ever taken in my life. [0:03:51] JH: Oh, that’s funny. [0:03:53] KB: You know I thought maybe I wanted to go into the medical field and looking back, I don’t think it was for the right reasons. I think it was like, “I want to be a doctor because I want to have a lot of prestige and make a lot of money.” That’s more like an 18 year old thing, right? So luckily, through my course of study, I think it was organic chemistry that did it for me. Shout out to my organic chemistry professor who convinced me that I did not want to go to medical school, thank you so much. [0:04:21] KB: Well, I was trying to decide what I wanted to do in college and I took a personal finance course just because I felt clueless. I don’t think it counted towards anything. I think I was out of electives. It was an elective, it was probably like hour number 35 but I already had 30 and I fell in love with it. I was just like, “This stuff is amazing. I love it. I love all of the numbers.” Like seeing the goals that are working backwards from there to figure out what you need to be doing. I was like, “I have no earthly idea how am I going to get into this,” because at that point, I was three and a half years into a biology degree. I’m a four year program. I was like, “I have no idea how I am going to get into this but somehow, I would love to be doing financial planning now that I have discovered it and I know what it is.” So I did. I graduated, I went and did something else for two years. I did auditing in a hospital, woo snooze. [0:05:31] JH: Its persistence and you’ve got to be persistent. Well, that’s great. Well, that’s funny that we’re both biology majors because what did it for me, I was going to study dentistry and then I don’t know why a picture came into my head that, “Oh my goodness, not everybody’s mouths are going to be pretty,” and I don’t have a good stomach. Also, was the fact that labs, it was so hard for me to find whatever I had to find in the darn microscope, so those two things did it for me. [0:06:12] JH: I just remember I couldn’t find, that was a challenge for me, finding whatever it was I had to find under the microscope. I just couldn’t see, I’m like, “How could you see this?” But anyways, moving on! So tell me why your interest, because I know you focus on the Gen X and Y. So why this era of people? [0:06:33] KB: I have been in the industry for, I am coming up 11 years now actually. [0:06:39] KB: And within my industry, within financial planning, financial services, financial advisors, there are a lot of people that focus on either people that are already retired or people that are right about to retire and that have money. So that’s something that I’ve noticed over the last couple of years that there are not many people that are doing true comprehensive financial planning for younger folks. I say younger folks, I’m 35, I don’t consider myself young anymore. [0:07:10] JH: Yes, you are young. You are. [0:07:12] KB: By younger, I mean people in their 20’s, 30’s, 40’s even in their 50’s that are trying to get started or trying to figure out where they are right now and readjust their compass. [0:07:26] JH: Right, okay. No, that makes sense and that’s good that you saw that opportunity because I agree, there is a lot and of course things are changing now and you’ve been in the industry 10 years and things are changing but yeah, I’m glad. That’s great that you saw that opportunity because it’s definitely needed. [0:07:47] KB: I think of it more as a calling. [0:08:02] JH: I love that. Well, I’m also curious, I want to get a little bit more of a scoop on you on the personal side. So tell us something interesting or unique or something that you’d be willing to share that maybe not many people know about? [0:08:19] KB: Well, I married my husband who is a rocket scientist. [0:08:24] JH: Oh, really? That is interesting and unique. [0:08:28] KB: He went to A & M for aerospace engineering degree. He’s very shy so he would be embarrassed if he knew that I was telling everybody that he’s a rocket scientist. [0:08:39] JH: But everybody, you’re sworn to secrecy. Don’t say anything to him. [0:08:43] KB: Exactly, yes everybody listening, hush, don’t tell him that I told you. So he actually works on airplanes. He did get to work for a little while on college on a NASA mission that was one of the space rovers. So what he does is really, really cool. [0:09:00] JH: It sounds like it and tell us about just growing up, how you grew up around money so what you experienced, what you saw, maybe some of the conversations you heard or you had with your parents, your siblings, tell us about that. [0:09:18] KB: Yeah, my parents they have always tried to be really good with money. I do remember quite a few times, this was way back in the day, I’m aging myself, when we had a home phone. Does anybody remember that? [0:10:10] JH: Or maybe it was the lesson of what not to do. [0:10:13] KB: Right, so I mean I think my parents really tried. They gave us a great upbringing so I’m not even going to complain about that at all. They were definitely parents that always try to give more to their kids than they had when they were growing up but there were just some things about money that they didn’t necessarily educate themselves about it or they just let it get a little bit sloppy. [0:11:01] JH: Well good for you, so basically your experience was more around or your memories are from those phone calls and did they give you, because of course they gave you a great upbringing but did they ever give you some financial advice or they really never talk to you about money? [0:11:20] KB: Yeah, so my family, we didn’t really talk about money. It wasn’t an open subject. It only came up really when it was things like, “Why are these people calling to ask for you to pay your credit card bill?” So I remember the conversations that I had were more like reactive instead of proactive with my parents at least. I did have other family members that I feel like I learned money lessons from more proactively. [0:11:45] JH: Okay and tell us about that. [0:12:02] JH: Sand, rocket scientist, this is interesting. [0:12:05] KB: Yeah, I know so he’s really into finance and he was all excited that I wanted to go into finance because for a long time, he encouraged me to read The Millionaire Next Door when I was pretty young. So that’s a book essentially about interviewing people that are millionaires and what did they do to get there and the point of the book is that they didn’t really do anything sensational to get there. They just worked hard and they lived on less than they made and they saved and they were intelligent with their money and they didn’t gamble it away. Those people were really well off and relaxing and enjoying life and so just in conversations with my grandfather and him encouraging me to educate myself, I feel like that was also part of the reason I wanted to go into this as a career. [0:13:00] JH: Interesting and so what was the best money advice that you’ve received? [0:13:07] JH: Him or someone else — sorry. [0:13:09] KB: Yeah, my grandfather is actually really big on negotiation, almost to a point where it’s funny. I mean this guy would negotiate anything and everything but it was great because I feel like sometimes as women, that’s something where we just do not like it at all. [0:13:29] JH: I love it. It’s in my blood and my husband, it took him a while to get used to and I don’t know if it’s from being brought up Latina and that’s just something you do all the time but yeah, it took him a while to get used to that. [0:13:46] KB: Yeah, my husband too. He’s like, “Look, we don’t talk about this stuff. I don’t”, — you’re making a big purchase. You know that their interest are not aligned with your interest, that’s when you negotiate or when you’re in a job and you know that you’ve been doing a great job and you’ve been keeping track of all of your accomplishments and you have a review, that’s a great time to negotiate. So I feel like my grandfather did a really good job of kind of teaching me the appropriate times to stand your ground or be able to express your value or what it is that you’re trying to get out of that exchange and that allowed me to, I love negotiating cars. Sometimes I’ll do it for friends. [0:14:32] JH: Oh that’s funny. [0:14:40] JH: That is funny so tell us what you do well with money? [0:14:45] KB: Yeah, so I mean as a financial planner, I will say I’m not — I don’t compare other people to me because I love this stuff. Obviously I am doing it for a living, but I do feel like I really like planning out to the future kind of looking out and getting all excited about what we’re going to do when we just decide that we just want to work part time and what we’re going to fill our time with. Then being able to use that as motivation to stick with the savings plan that otherwise we’ll be stocking money away and count on and don’t even know what this is for. So I tend to be the person who does a lot of the long term dreaming or visualization of what the future is going to look like. [0:15:33] JH: Right, perfect. Now, how about some challenges? We all definitely have some challenges when it comes to money so tell me about yours? [0:15:40] KB: Yeah, well I find that in the relationship that I have with my husband, I tend to be the long term planner and he is a lot better at the day to day money management. So glad that we figured this out sooner rather than later because it’s funny the differences like if a bill comes in, back in the day I would essentially take it and put it in my pile of stuff. [0:16:48] JH: But do you find with those reminders because they are so easy to create but do you find them that sometimes you just see them so much, not necessarily so much but you see them enough that it’s just kind of, you just ignore them so to speak? Not ignore them but I will get to it later and then you don’t really unless you make a snooze there or whatever? [0:17:10] KB: I am not a snoozer. I put stuff actually on my calendar so I can’t really snooze it like it just goes to the next day and if I didn’t do it. [0:17:18] JH: Okay, I didn’t know if it was an alerts on your phone. [0:17:22] KB: But I mean I tell people now it’s so easy to automate stuff. [0:17:24] JH: Yes, it is. It makes it so much simpler. [0:17:28] KB: The moment you sign up for a new cellphone plan, go on your computer, go set it up as an auto pay and be done with it and try to put as much stuff — try to balance it out between the first and the 15th of the month but then just put it on autopilot. You don’t have to think about it unless something changes. [0:17:47] JH: Right. So basically the challenge that you’ve had is pretty much solved with the balancing of your husband and putting it on your calendar. [0:17:58] KB: Yeah. I do have to realize that if for some reason he’s never part of the equation, that I’m going to have to figure out how to work around myself on that and I think I just described how I would probably do that but it is something to be aware of if you’re in a relationship. There doesn’t have to be one person who’s in charge of all the money stuff. You can have somebody that’s better at the strategic part of it and somebody that’s better at the day to day as long as you communicate back with each other then that’s a great balance to have. [0:18:33] JH: Absolutely, as long as you’re just, like you said, communicate and both are in the know it’s however works for your specific situation so that’s perfect. Now, I have several questions actually hopefully, we’ll get through these, that have come up and some that I just wanted, just some basic questions that I wanted to throw out there. So that way, on the same page but I wanted you to talk a little bit about what is a financial planner and what the benefits are of having one? [0:19:15] KB: Yes, great question. A financial planner, the best way that I put it is, that’s a person who helps you take all of these puzzle pieces that right now might be stacked neatly in a pile or with some of my clients, half of the puzzle pieces are stacked neatly and the other half of them are in the couch cushions and underneath the table. A financial planner helps you take all of those pieces of your financial puzzle and put them together so that you can actually see a cohesive strategy moving forward with all the different pieces of your finances. [0:19:55] JH: I love that description and how you said that. That is perfect. Now, there is a lot of different acronyms out there or not necessarily acronyms but just terms. Acronyms, terms that you hear, financial adviser, financial planner are they one and the same? What is a fee only financial planner? A commission based planner? Can you take us through the different types of financial planners and explain that? [0:20:29] KB: Yeah. The financial adviser versus financial planner is probably pretty in depth but just on the surface level, I’ll tell you that some people use them interchangeably. [0:20:42] JH: That’s what I have seen so that’s why I want to make sure and ask you and put it out there. [0:20:46] KB: Yeah and it’s mainly just, it has to do with licensing. As long as you passed an exam that allows you to sell mutual funds, stocks and bonds and even just mutual funds, you can call yourself a financial adviser if you do that plus you provide written recommendations and a lot of times, you can call yourself a financial planner. [0:21:33] JH: Right because there is just so many and the conversation I had with you before like my credentials “AFC” is not a term, or accredited financial counsellor. It’s not a term that’s well known so even though I may say that, people automatically assume I’m a financial planner or a financial adviser or whatever or any of those terms come up. I have to explain to them, “Whoa, that’s not me,” so with those different terms, it can be confusing so I just wanted you to speak on that. [0:22:29] JH: The big picture. [0:22:30] KB: Yeah, it’s part of it but A, I’m not a day trader thank goodness and it’s only a part of a cohesive coverage of financial plan. [0:22:42] JH: Right and so, commission based versus fee only. Tell us about that. [0:22:48] KB: Yeah, so there are different ways that financial planners can get compensated, financial advisers or financial planners can get compensated. So a lot of financial advisers and financial planners have some component of their compensation that is commissioned based. You can have advisers that are commission only so the only way that they get paid is if they sell a product. Sometimes you’ll see the insurance industry will do this. So they’ll have somebody’s an agent at an insurance company and the only way that they get paid is if they sell somebody one of the insurance products of the company so it might be a commission only adviser. And you have fee only which is the only way that they get paid is by compensation directly from their client. So either charging hourly fees, a project fee, a retainer, some people charge off of investments which is asserts under management but in any way, it would come from the client instead of coming from a third party company compensating that adviser. And then to make it even more complicated, I apologize, but there’s something called fee based advisers. Fee based are really a hybrid between the two. So they can do financial plans and they can charge for a financial plan but then they can also implement the plan by selling a product and putting that in place. [0:24:19] JH: Okay, see I was not even aware of that. There is just so much. [0:24:23] KB: It’s a little confusing. I know, so fee only is you’re only getting paid from a client fee based, is kind of like fee and commission but they don’t call it a fee and commission. [0:24:34] JH: Interesting, see I didn’t know that. I learned something new and then you are a fee? [0:24:39] KB: Yeah, so when I started my firm, I decided to go with a fee only firm. [0:24:44] JH: Okay and why did you decide on that? How did you come to that? [0:25:25] JH: I hear you! So tell me a little bit about how would you recommend someone to find the best financial planner for them? What they should look for, maybe steps they should take? [0:25:38] KB: Yeah, that’s a great question and it’s one that I get pretty often. It’s a little bit overwhelming especially with all the different ways that people are compensated and the different criteria or designations that people can have. So I break it down to four different things to look for. The first is, you want somebody who knows what they’re talking about. If somebody was selling cars last week and they’re selling an insurance product this week that is probably not the best fit for you to have an advocate for your financial goals. [0:26:16] JH: It makes sense. [0:26:17] KB: I always tell somebody a really good place to start is to look for a certified financial planner, CFP. In order to get a CFP, you have to have taken six different classes, you have to pass an exam and it has a historic pass rate of about 60% so it’s not an easy exam and they have to have at least three years of financial planning experience and then they have to adhere to ethical requirements that are up and above what other people would have to adhere to. So that’s a good place to get started on finding somebody that knows what they’re talking about it to try to find a certified financial planner. [0:26:59] JH: That makes sense. [0:27:14] JH: You definitely shouldn’t be. [0:27:15] KB: Yeah, don’t be embarrassed at all. You need to know if somebody’s interest are aligned with yours. If you’re going to somebody and you’re like, “Hey, you sell insurance and I need this type of insurance and I would like for you to put it in place for me,” that’s one thing but if you’re like, “Hey, I want somebody to guide me through all of these decisions that I have to make.” And you’re working with somebody and you have no idea how they’re actually getting paid, that’s not a good fit. So you always want to ask somebody. It doesn’t necessarily mean that you can’t work with them but I would say a warning sign is if they say that it’s free, then you want to do more research or you want to ask more questions. If you have to sign a financial planning agreement, that’s actually a good thing because that means that you are working with somebody that has to adhere with the fiduciary requirements of having a financial planning agreement. [0:28:13] JH: It makes sense. [0:28:14] KB: Those are two little things on what to look for with the free structure. [0:28:19] JH: That’s perfect. So look for a certified financial planner, a CFP and look at the fee structure and discuss it upfront. [0:28:27] KB: Right and the last two are somebody who listens to your goals. If you go in and you sit down with somebody and you start talking about, “This is what I want to accomplish,” and they’re like, “Hold on stop right there. I know what you need.” If you end up in that situation, big red flag. You might as well pack your stuff up and stop wasting your time and get out of there. Because you really want to work with somebody who will actually listen to you and what it is that you’re trying to accomplish and what your values are and what you want to do with your family and stuff like that. You really want to make sure when you actually do sit down with somebody that you feel like it’s somebody that’s actually listening to you and listening to your goals. [0:29:16] JH: That makes sense. [0:29:18] KB: And then the final things is somebody that actually works with people like you and I know that sounds funny but if you’re working with a financial planner and all that they do is work with people that have already retired and you’re 35 years old and you have dual income and two kids and you’re really focused on things that are not related to retirement, that might not be the best fit. So you want to find somebody that either works with people like you, works with the age group that you’re in or if you’re a business owner, you want to find somebody who specializes in working with business owners because working with business owners might be a lot different than working with two teachers that are married to each other. [0:30:02] JH: Yes, you bring up a very good point. I like that. Basically, those are some great tips, those four tips that you can implement. Now, let’s talk about information on the Internet because there is a wealth of information on the Internet. You can Google and find your answers, obviously some are incorrect. Not every on the Internet is true and we know that. [0:30:27] JH: It is not. I found this out today, I Googled that, no I’m kidding. Anyway, so if there is some information that you can find that is good so the question is why pay a financial adviser to tell you what to do when you can get that information for free? How would you answer that? [0:30:49] KB: Yeah and you know what? I think that’s a great point because today’s world is a lot different than it was 10 years ago and it’s a heck of a lot different than it was 20 years ago and so it’s an advantage that we have in this era that there is so much information out there. You don’t have to rely on somebody to just tell you exactly what to do. You can go and do your background research. Where some people get a little bit tricked up is that they tend to look for stuff and then they sit there and go, “I don’t know, is this relevant to me?” Or, “Is this relevant to my situation? I don’t really know what to do with this information.” I think the value of working with a financial planner would be that the financial planner can help you actually sort through all of this information that’s out there to help you figure out what actually is the best course of action for you, your goals and your values. [0:31:47] JH: Because the internet doesn’t know that. [0:31:49] KB: The internet does not know that. [0:31:51] JH: They didn’t ask that. They haven’t asked me that, the Internet, so yeah, they definitely know, that is a very good point. The Internet does not know your core values and exactly what you want out in life. [0:32:01] KB: FYI, companies pay big bucks to be at the top of Internet searches so sometimes, the advice that you might be reading might be advise that is biased to because it’s to suggest to sell a particular product. [0:32:16] JH: Yes, especially they’re at the very top. It’s not always clear but it’s at the very top when you Google something and it’s separated from the rest of the search results or on the side right? [0:32:44] KB: Yeah, keywords in there that will pop up at the top of searches and it’s the same deal, know what it is that you’re reading and is it an insurance company that’s telling you that you need to take out a big insurance policy? Is it a mutual fund company that’s telling you that you don’t need to put any money in insurance, you need to put it all on mutual funds? Just know where that information is coming from so that you know if there is a slant on the information but a financial planner can help you sort through all of that to help you cut out the clutter and figure out what’s actually the best course of action for you. [0:33:21] JH: That makes perfect sense. Now, what would you say to someone that wants to hire a financial planner but of course, like anything, there’s great financial planners and there are those that make it difficult or maybe not necessary ruin their reputation but damper the reputation of financial planners. So how would you address or talk to a person that wants to hire a financial planner but it just really frightens the pants out of them? Where do they start? You’ve given some tips as far as what to look for but how do you engage with one when you’re so frightened? I tell people, first of all, do your research beforehand. We gave some good tips on how to actually find a good financial adviser or financial planner. If you’re stuck with one you don’t like, don’t feel you have to be stuck. Go talk to somebody else. Get a second opinion. If you went into a doctor and they said that you had a life threatening disease, I’m pretty sure that you would leave and you would go get a second opinion. So do the same thing with your finances. But if you’re somebody who feels like you’re embarrassed about your situation or you just don’t feel like you’re on track and you don’t want somebody to look down at you or to fuss at you, I would say that’s part of finding a really good financial planner because a really good financial planner will be there to help you take where you are right now, figure out where you want to go and then help you draw the roadmap there. As opposed to telling you what you should have done or shouldn’t have done. We can’t do anything about the past. There is no rewind button. There’s no back to the future, going back in 10 years and doing it again. You just have to start from where you are and move forward and finding a good fit of somebody who will listen to you and understand your goals and needs is really key to finding someone that’s not going to make you feel embarrassed or shamed about your situation. [0:35:55] JH: Absolutely. I totally agree with that. Now for people, and this is along the same lines, one fear that came up is that a financial planner is not advising you for your benefit but rather for theirs. So how would, I know we talked about the fee based like you, fee based planners, would you recommend those or how can you assure them that they would be advising you for their benefit and not yours? I mean obviously, you have to do your research and follow some of the great tips that you gave, but what would you recommend to address that fear? [0:36:42] KB: Yeah, I think that’s absolutely something that somebody should go into, search for a financial planner with that question because nobody cares about your money more than you care about your money. I think at the end of the day, you need to be a good steward of your money and know that somebody else isn’t going to be able to solve something for you. They’re going to be able to provide you the information and help you, but in doing your research and knowing if your interest are aligned or if they’re not aligned, I think that helps a lot to cut out the clutter because if you’re meeting with somebody and all they’re doing is selling you something, then that’s not somebody that’s actually acting as a financial planner. Yes, exactly that’s the flag. [0:37:29] JH: So we’re looking for those flags for sure. [0:37:43] JH: Right and just remember that you’re in control and you can go talk to another person. You don’t need to be stuck like you mentioned before with one particular person and of course, with financial planning, there is that stereotype that you need a lot of money to hire one. Some people don’t feel like they have enough money to hire one. So when should you hire a financial planner? [0:38:08] KB: Yeah and that’s a really great question. I would tell people that traditionally, there have been some fee only financial planning firms that have investment minimums. Investment minimum would be that they say, “Well, in order to work with us, you need $250,000 that we can manage.” Not a lot of people that are in their 20’s, 30’s or 40’s are just sitting around with a pile of cash that they’re not doing anything with. Normally, it would be in home equity or it would be in a 401(k) or you would be working on having the money going. Recently, there had become more fee only financial planners that will work either on a project basis or a retainer or a monthly retainer to help you through a financial plan but then also to keep you on track and keep changing that financial plan because when we’re in our 20’s, 30’s and 40’s, a lot changes. Life changes rapidly and quickly. [0:39:22] JH: I have experienced that. [0:39:40] JH: That’s not a good plan. [0:39:41] KB: That’s not a great plan. You need to be working on going with somebody. [0:39:45] JH: Absolutely especially when life changes because life happens all the time. So you have to reassess and readdress things, so I like that. Well, let’s talk about late savers because everyone’s financial journey is different and unique and some people start saving for their future later than others. So what kind of tips would you give if you’ve started saving late for your retirement? [0:40:11] KB: Well, one of the biggest things that I tell people when they’re like, “I haven’t saved enough or way behind,” is, “Get off of the sidelines.” You don’t need to still be sitting on the sidelines waiting for somebody to tell you to get into the race. You need to just get off the sideline, jump in, even if it’s like you’re putting 50 bucks away in a new account or you start contributing to your 401(k). [0:41:33] JH: Take some action. That’s where it’s at, perfect. Now, this next question that came up, of course, we don’t know the specifics of this situation. Well, you don’t know and basically it’s about this particular person is nearing retirement. So maybe you could just give some general information since we don’t know the specifics but they didn’t do the financial planning, but if this person has cash to invest now, what is the best way to make the most out of it? They’re late savers, they didn’t do the financial planning but they have cash to invest now. Kind of hard to answer maybe? [0:42:17] KB: Yeah, well what I tell people is you wouldn’t normally jump in your car and then just start driving a 100 miles per hour without figuring out if you’re supposed to be going east or west. [0:42:31] JH: It makes sense. [0:42:31] KB: This is kind of like going, “I just want to jump in my car and I want to drive a 100 miles per hour.” And so if you’ve got cash to invest and you don’t really know what you’re trying to do with it or what direction you’re trying to head, it’s really hard to figure out what you should actually be doing with that and the reason is that there are retirement accounts that are specifically for retirement and have rules around them and special considerations that you get for using them for retirement. Sometimes people are on the ground level and it’s hard to see where you’re going. So I always encourage people to think of it as like you’re getting into a helicopter and you’re going up in the air, where you can see everything then everything looks itty-bitty but you get that 30,000 foot view and that helps you figure out where you actually need to be going. Then you come back down and you implement everything and going to the right place. [0:43:54] JH: So basically, you’re saying get clear as to where you want to be, what you want your retirement to look like and then from there, work backwards, correct? [0:44:05] KB: Yes. Yeah, exactly. [0:44:08] JH: Perfect, well this has been amazing. We can talk so much longer but it’s been great. You’ve been a wealth of knowledge so I really appreciate your time here. So I want to finish off with, for you just finishing this phrase that I always ask because this podcast is essentially just to make money simple and taking control of it. So how would you finish this phrase or make it into a sentence I suppose? Her Money Matters because? [0:44:40] KB: Her Money Matters because no one else cares more about your money than you care about your money. [0:44:46] JH: Perfect, that is perfect, it’s always interesting hearing all the answers. So this has been great and just tell us where can people find you? Where is the best place? [0:44:57] KB: My website is Yourrichestlifeplanning.com. If you’re lazy like me and you don’t want to type all that out, you can also go to YRLplanning.com. So that’s my website, I’ve got a blog there that has a lot of articles and information and then you can always find me on Twitter @katieyrl and e-mail, you can e-mail at info@yrlplanning.com. [0:45:30] JH: Perfect. So I’ll just make sure that I include that in the show notes so everybody can have that and again, thank you so much Katie. This has been great. I have learned so much because I know being in the area of personal finance, I know I don’t know it all especially financial planning so I just want to make sure that I bring people like yourself that can speak more specifically in this areas because it’s definitely very beneficial and very helpful. [0:45:59] JH: So again, thank you so much for joining me. [0:46:02] KB: All right, thanks Jen. [0:46:04] JH: All right, thank you. [0:46:07] JH: Oh my gosh, that was just so much fun and I felt Katie was amazing and I hope that you did too. It was a lot of information and usually, that type of information in financial planning is just overwhelming to me but she explained it with such great analogies that it just made things so much more simpler, so I hope you felt the same way. I’m going to let you in on a little secret that you can actually meet Katie over in our private community on Facebook at jenhemphill.com/community. If you’re interested in meeting her virtually, she will be there. I’ve designated our community certified financial planner for our community. So I wanted to let you know and let you in on that. I wanted to take just a moment to thank Adrianne, Ruth, Terry and Nicole for such great questions that you posed for Katie to answer. And I wanted to give you a quick action item for you to take especially if you’ve been thinking of financial planning, thinking of the long term for retirement, life insurance, and all that good stuff. If you’ve been thinking about those things, I challenge you to take some time to reflect. To sit down and really think about what you want your life to look like in detail just get a specific. Don’t be afraid to dream because the more information, the more details that you have down and the more clarity, the better that financial planner that you hire is going to be able to help you. It’s like going to the doctor for having some sort of illness and maybe you haven’t paid attention to the symptoms or you didn’t tell the doctor, maybe you only told him or her one or two of the symptoms. If you aren’t clear and tell them everything that was happening, they can only recommend a best course of action for what you have told them, right? Maybe they would have been able to recommend a better course of action fully knowing your symptoms and your situation. So just think about that and if you’re thinking, “Well Jen, I don’t even have my finances in control. I don’t even know what’s going on with them.” The best thing I would say is to start with where the money is going. I have the Jumpstart Your Money mini-guide that you can get. It’s free, you just go to jenhemphill.com/miniguide and that’s just going to lead you. It’s the pre-budgeting phrase instead of starting a budget, you need to know the numbers so you can just plug them in easily and this is the pre-budgeting phase of your money planning, okay? So if you’re confused, if you’re overwhelmed, this is a really a really good place to start. So that’s jenhemphill.com/miniguide. So that is a wrap. I want to thank Katie again for joining us, for being just an amazing guest, sharing so many good tips and her expertise. 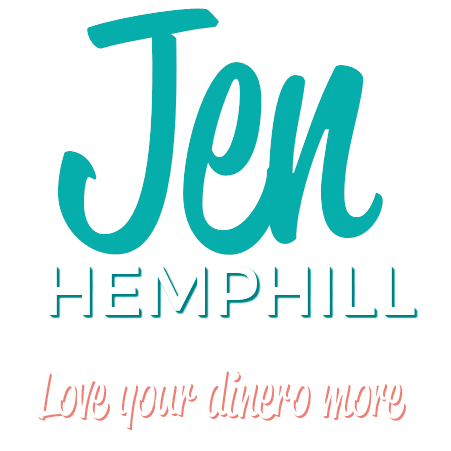 Be sure to check out the show notes for where to find her and all the different links that I’ve provided at jenhemphill.com/33. Thanks again for tuning in and we’ll talk again next Thursday.